The last Scrap Saturday to show off our Orange scrap blocks. I saw some Halloween project in the works and got dreaming of pumpkins. Better then dreaming of food - started a diet and was dreaming of white bread and butter the night before. 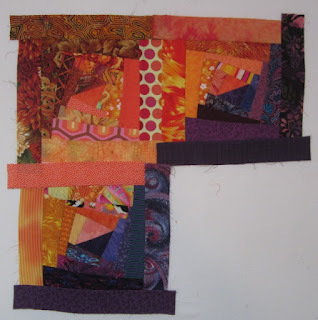 Besides all the orange scraps, it is making a bigger dent in the purple scrap box. 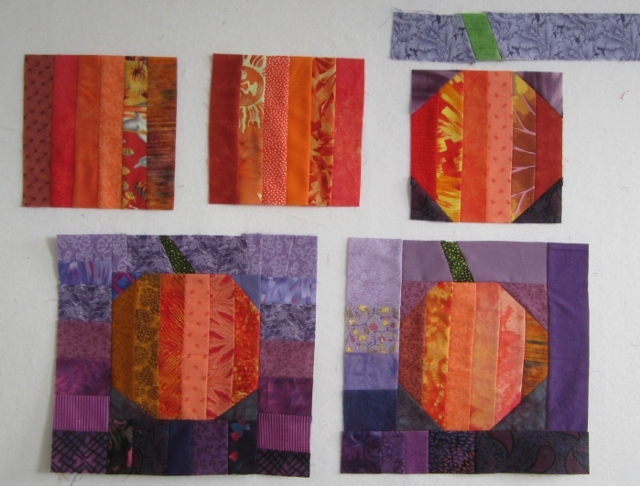 I got started on the pumpkins today and got two blocks complete and a start on three more. Not sure what they will become. Maybe a wall quilt or runner. At this stage they are about 10" square. 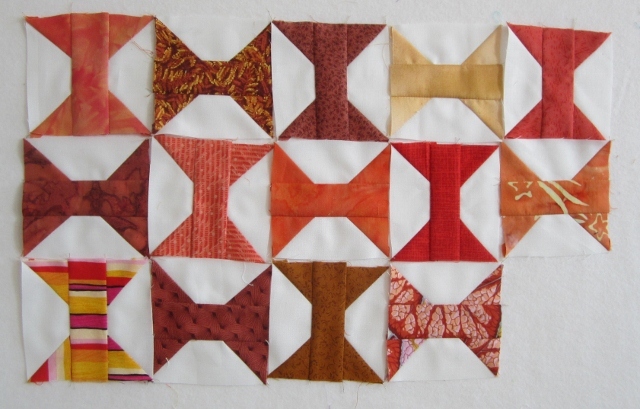 The orange strip set in the middle started as a 6 1/2" square. I also got working on something new. I see others making blocks of 4 patches or 16 patches and I thought I would make some 16 patches but I have added in one little twist. Each block has one square that is a contracting colour. In the case of Orange it got a blue or purple square. 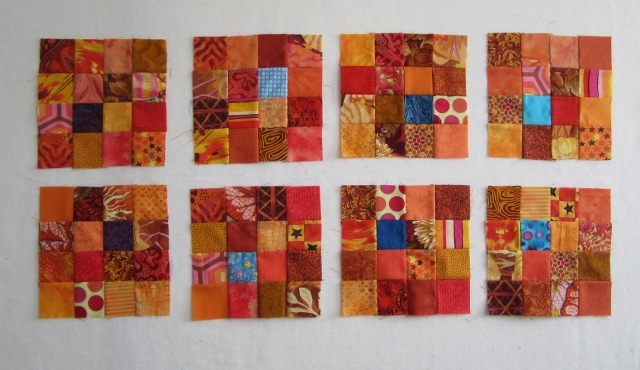 These are made up of 2" squares and now measure 6 1/2" square. We will see how I use these. Go to Soscrappy to see more about Scarppy Saturday and all the other Orange happening. I wounder what colour we will get next month. I could do Black or black and other colours mixed in. Brown could happen too. Three month left and all my favorite colours have been used up. I also needed some Orange wonky log cabins. One full orange and two that had a dark purple side too. You just wait till the end of the year and I have to put the log cabins together. Here are new Orange spools that I worked on today as Leaders and Enders. I also have a stack from early in the month. I have signed up for Blogoberfest 2012. I have added the button to the right side. I am to blog every day in the month of October, and share my creative sprite I think I will host a give a way. I will have to think about what I will give away. Maybe some dyed fabric. The purple looks great with your orange. What a great way to use up two colors of scraps at the same time. 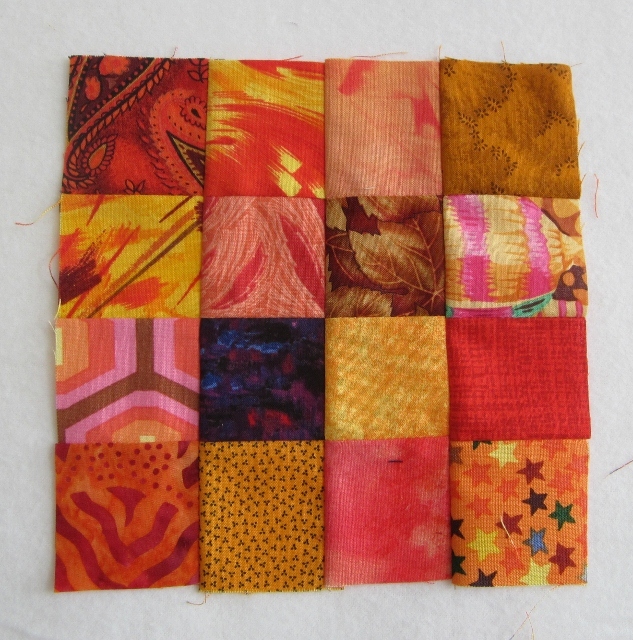 You've been busy, lots of nice blocks, I particularly like the 16 patch with the contrasting colour, a real eye catcher. 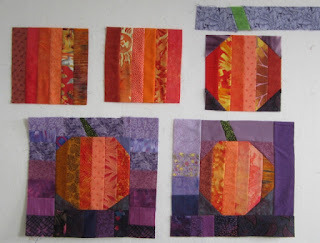 Great orange blocks and your pumpkins are so neat! My goodness! I think you've been playing with orange even more than me! 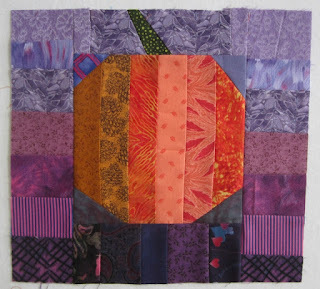 The pumpkins with purply shades look very fall-ish - great color combo! Smart idea, adding a contrasting color to your 16 patches, adds a nice little pop! As ever, I am intrigued with your wonky log cabins - is there a tutorial somewhere out there in blogland on this technique? Thanks for the eye candy! You've done a lot with your oranges Cathy :) Love them all. Isn't it amazing just how many variations on orange there is. Lots of pretty orange goodness going on this month at your house. Love your orange pumpkins. I wanted purple in mine but lost the vote in my house... the kids and Grammy wanted green and tan. I, too, have stacks of blocks from this rainbow challenge. Will be fun sewing all our blocks sewed together in December. Oh yeah. My favorite colors have been chosen. Still looking forward to Oct, Nov and Dec. I can't wait to see that wonky log cabin put together - I love the idea to put HST's in the center. You have done so much with your scraps. The pumpkins were such a cute idea. You definitely have a very creative streak within you!